10 IN 1 PLUMBER MULTI TOOL The HDX 10-in-1 Multi-Tool with Pouch is a versatile plumbing multi-tasking tool. This multi-tool includes a heavy duty PVC cutter, a combo knife, a saw-tooth blade knife, a flat-head screw driver, a Phillips-head screwdriver, and a multi-use premium cutting blade. This tool also features a built-in flashlight for working in poorly lit areas. 10 IN 1 PLUMBER MULTI TOOL is rated 3.8 out of 5 by 29. Rated 1 out of 5 by Mikekoz from The knife was dull out of the package, and is made with poor steel and is very difficult to s... The knife was dull out of the package, and is made with poor steel and is very difficult to sharpen at all. Most of the tools are a little difficult to open, and they clump together when doing so. Putting a little oil on the pivots did not help. I cannot comment on the cutters but they are loose and wobble. The only good thing I can say about this tool is the scales are comfortable when using it. Over all though, a poorly made tool. Rated 2 out of 5 by enviro from Price reflects value. Blade quality/function is poor. Relatively useless on PEX a/b etc. (at room... Price reflects value. Blade quality/function is poor. Relatively useless on PEX a/b etc. (at room temp) the cutter simply flattened the conduit. Rated 3 out of 5 by scottie from good tool but the cutter isnt great everything on this tool is good except the pipe cutter which is the main reason I bought it. I tried to cut a 3/4 pvc pipe and it wouldn't cut it. Rated 4 out of 5 by TXRemodeler from This is a reasonable good multi tool This isn't the best multi tool ever made but for the price it isn't bad at all. It has the features you'll need for may common plumbing tasks. I don't know how long it will last but I have no doubt it will last long enough to be considered a good value. 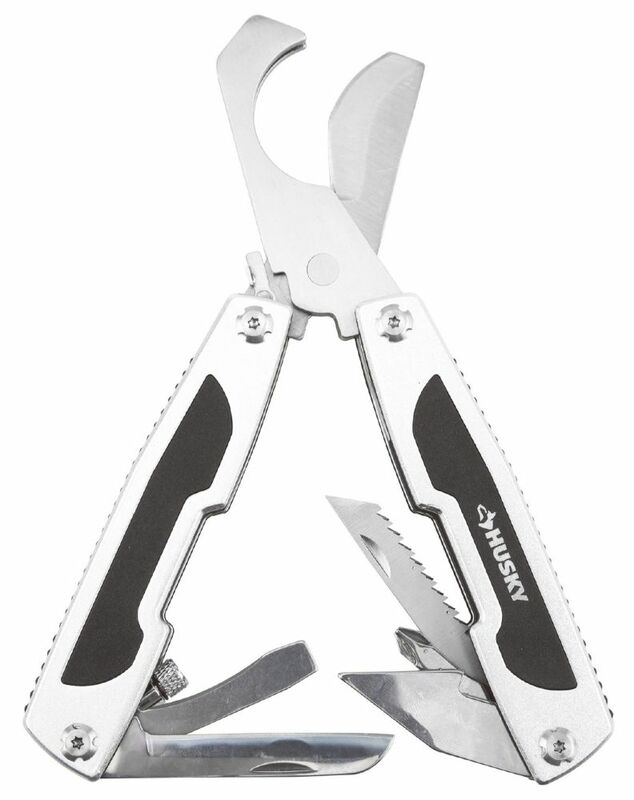 Rated 3 out of 5 by casablancafan from Good multi-tool This tool is good for tight spaces; especially like the light. Folds up nice and small into its own carry-pouch too. Rated 5 out of 5 by NS86 from Versatile multi-tool I'm not really a plumber, so many of the features are are not really that useful to me. However, the blades and pipe cutters are versatile and universal enough for most users. I found the LED light also pretty useful, especially for situations where one wouldn't normally have a flashlight handy. As a a whole, great value.